NEW YORK, NY--(Marketwired - September 30, 2015) - Advertising Week 2015 is only halfway complete and global media agency MEC (www.mecglobal.com) has already extended job offers to 10 lucky entry level candidates who participated in its first-ever Live Hire on opening day of the premier gathering of marketing and communications leaders. Congratulations to: Deena Baig, Caitlyn Carpentier, Jordan Cohen, Nicole Dalessandro, Jeffrey Denney, David Miller, Conor Mitchell, Praise Odigie, Geomar Sanchez, and Ndish Tulsiani. Three new hires will be relocating to New York from Florida, Toronto and Washington, D.C.
MEC Live Hire, a first of its kind recruitment event, brought together new and upcoming graduates from across the U.S. to meet live in Times Square with a team of cross-functional executives, including Global CEO Charles Courtier and North America CEO Marla Kaplowitz, for a new-type of behavioral hiring experience. Sixteen candidates interviewed with four MEC executives in the span of two hours. MEC evaluated candidates against key tenants of the agency's culture, resulting in same-day offers to Associates in Digital, Planning, and Analytics & Insight. The full day event marked MEC's commitment to driving the talent conversation forward. "We are thrilled to welcome such bright and ambitious new candidates to MEC. 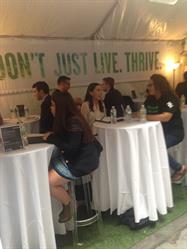 Advertising Week is ripe with diverse talent at all levels, giving us a real forum to bring our behavioral interview experience to life. This new way of hiring allows us to be quick and nimble in our approach, ensuring we continue to attract and retain the very best talent in the business. But there is still work to be done. As an industry we have a responsibility to drive forward innovation in the area of talent management for the growth of our people, our clients and our future," said Marie-Claire Barker, MEC's Global Chief Talent Officer. The MEC Talent team will be on the ground for the remainder of AWXII in search of more top talent to join its team. Candidates line up at MEC's Live Hire Event at Advertising Week. Candidates being interviewed by MEC executives at the Live Hire event. 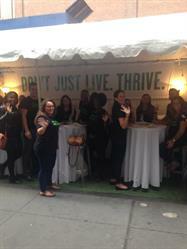 MEC's street team on the ground at their Advertising Week Live Hire event.